This time of year the Waikato is full of delicious chestnuts, falling off the trees, waiting to be eaten. How great is that! When David Klinac of the New Zealand Chestnut Council contacted me recently, I jumped at the chance to find out more about the local chestnut growing scene. I visited the Gordonton warehouse where David and chestnut industry veteran Tony Jolly operate machines which peel whole chestnuts and/or turn them into crumb. On the day I visited there were several local growers processing their crops, including Yotam Kay of Pakaraka Farm in the Kauaeranga Valley, and Jim Stewart, who’s a regular at Hamilton Farmers’ Market. 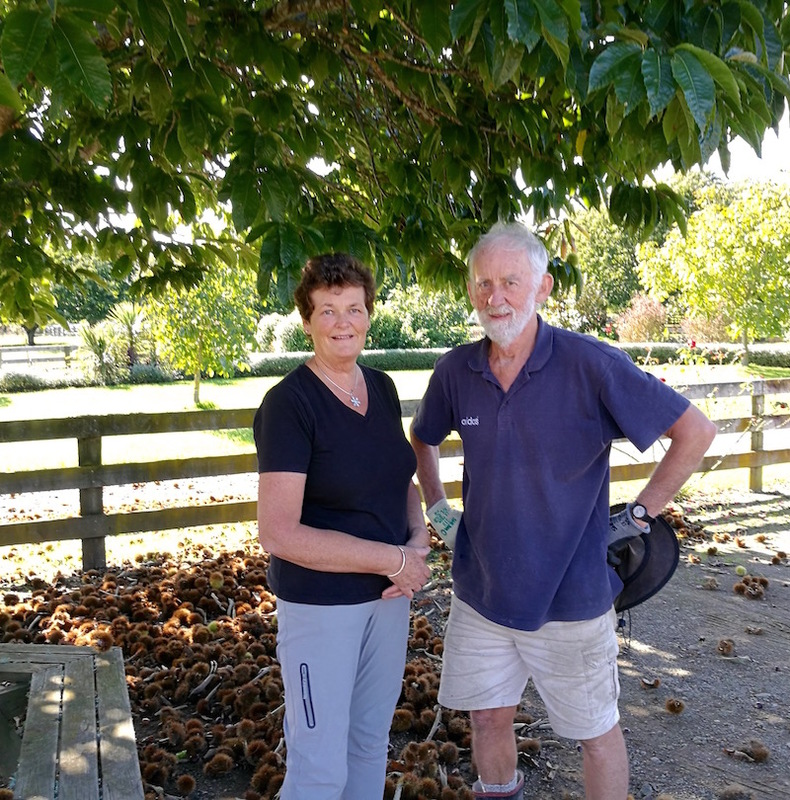 I also paid a visit to Jackie and Godfrey Larsen’s “pick your own” chestnut farm a few kilometres down the road, on the other side of Gordonton, towards Taupiri. 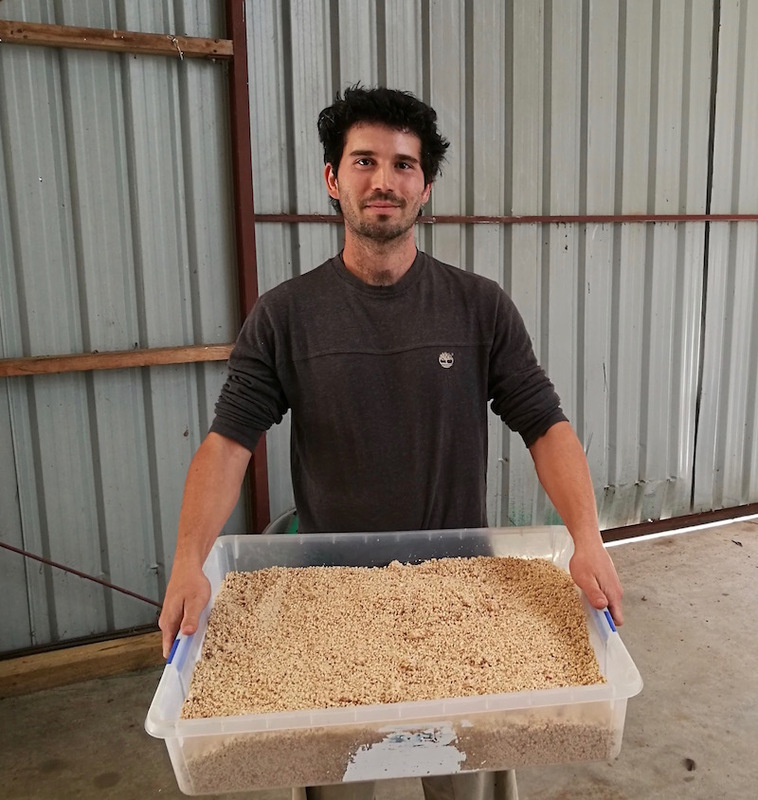 Above: Yotam Kay of Pakaraka Farm with a tray of chestnut crumb, ready for the freezer. Chestnuts are a perfect solution to a whole range of food and diet issues. It seems only a matter of time before somebody declares chestnuts a superfood. They don’t contain gluten. They fit into paleo, vegetarian and vegan diets. They are low in allergens, unlike other nuts. Chestnuts are full of great nutrients – e.g. they contain more vitamin C than citrus fruit. Chestnuts are also a beloved traditional food throughout Europe and Asia, sold simply roasted as street food or turned into such delicacies as chestnut-chocolate puddings of France, Italy and Switzerland; and Japanese candied chestnut and sweet potato mash, Kuri Kinton, which is an important Japanese New Year celebration food symbolizing economic fortune and wealth. 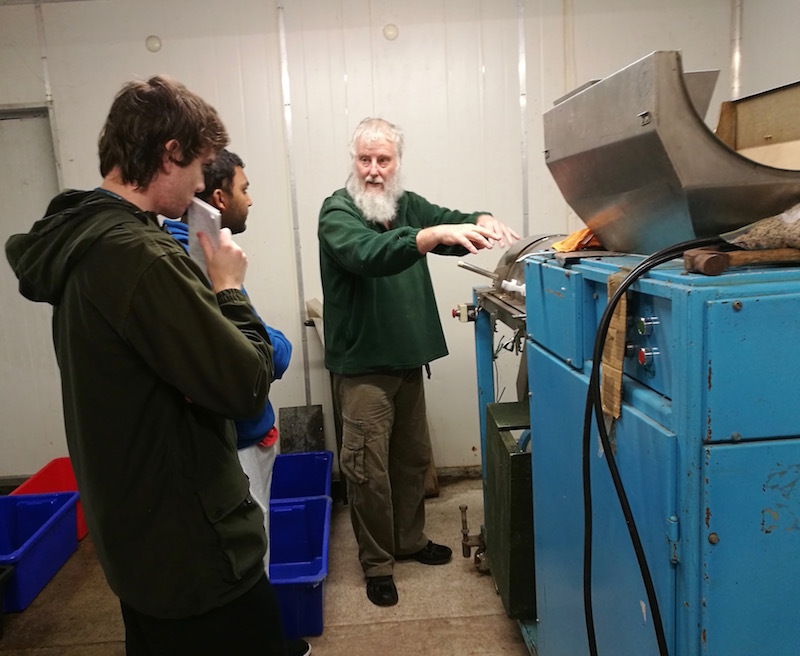 Above: David Klinac with fourth-year Waikato engineering students Thomas Archbold and Aniketh Kumar, who are working on research projects to find ways to separate chestnut fragments from the waste peelings after the chestnuts have gone through the crumb machine. David Klinac says chestnuts grow well in most parts of New Zealand, including the Waikato. A chestnut tree grows quickly and starts producing within three to four years. The chestnuts that grow well in New Zealand are local hybrids of Asian and European varieties. This is great because they’re not susceptible to the diseases that are currently blighting chestnut crops in the northern hemisphere. New Zealand chestnuts can be grown here easily with full organic certification. Because of the diseases impacting chestnut crops worldwide, there’s a lot of international demand for chestnuts. 1. Chestnuts only stay fresh for a few weeks after they fall off the tree. And international demand is mainly in the northern hemisphere chestnut season, which is six months different from the New Zealand chestnut season. Also, the main demand is for unprocessed chestnuts – yet another example of New Zealand being asked to export raw materials without added value. 2. New Zealand chestnut varieties have a couple of key differences from northern hemisphere chestnuts. They are variable in shape, which makes peeling harder. This is also a critical piece of information for New Zealand chestnut cooks. See the later section on “Peeling New Zealand chestnuts” for what to do about this. Above: Godfrey and Jackie Larsen in front of one of their prolific chestnut trees. Their biggest customers for pick your own chestnuts are Chinese and Koreans from Auckland. There are several New Zealand companies using chestnuts in delicious and interesting ways. Pakaraka Farm, which is the Coromandel farm founded by Jeanette Fitzsimons and Harry Parke, turn much of their certified organic crop into frozen or dried chestnut crumbs. 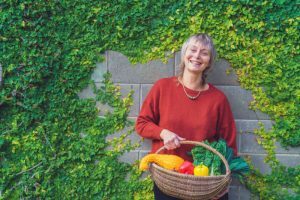 See the end of this article for where to buy their products. There are a couple of New Zealand brewers making chestnut beer. Phoenix Gluten Free make chestnut crackers. This is one of those times when googling isn’t helpful. The instructions that northern hemisphere cooks give for peeling chestnuts won’t result in a white chestnut with no pellicle coating for New Zealand cooks. Peeling chestnuts is a bit fiddly, but it’s not particularly time-consuming, especially if you can get a couple of people to join in. Leaving a bit of the brown pellicle is okay. Whole nuts: If you want whole nuts, you’ll need to peel using a sharp knife or a Japanese chestnut peeler, which can be bought from the New Zealand Chestnut Council. Jackie Larsen uses a heavy-duty vegetable peeler. Chestnut puree: If you just want chestnut puree, then simmering the whole nuts for about 20 minutes, cutting them in half and scooping out the flesh with a teaspoon while they’re still warm is the easiest way to do it. 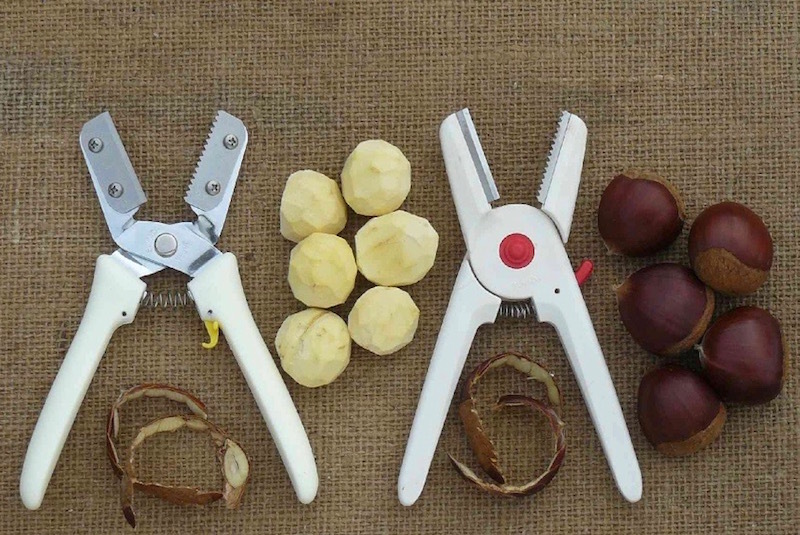 Above: Japanese chestnut peelers – the fastest way I’ve found to peel chestnuts by hand.These can be bought from the NZ Chestnut Council – see the contact details at the end of this article. It’s a very sharp tool. I’d strongly recommend wearing finger protectors. I’m not letting my household of musicians anywhere near it! Photo by David Klinac, used with permission. Use them quickly! When you buy your bag of chestnuts, don’t leave them in the fridge for weeks. Even in cold storage chestnuts will go mouldy. Here’s a link to a post I wrote with my all-time favourite chestnut recipes, including chocolate chestnut pudding and pumpkin and chestnut soup. Chestnut crumbs, frozen or dried, can be used for crumbing fish or schnitzel, and for thickening soups and stews. They also make great gluten-free crumble topping. Pakaraka Farm sell chestnut flour and crumb through their website, see the end of this post for the address. Gordonton pick your own – on the main road, a couple of kilometres towards Taupiri from Gordonton village. 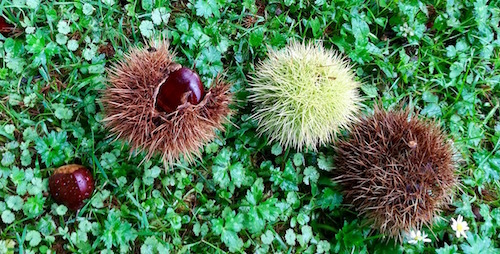 Foraging – there are several sweet chestnut trees in public parks in Hamilton. NB Make sure you identify your tree. Don’t mistake sweet chestnuts for horse chestnuts, which are not edible. This is the national chestnut growers’ organization. They import and sell Japanese chestnut peelers and are also a great source of information about the local chestnut industry. www.pakarakafarm.co.nz They sell chestnut crumb, frozen and dried, and fresh chestnuts in season. In the chestnut season you can buy their delicious roasted chestnuts at the Thames market. Here’s a link to some of my favourite chestnut recipes.